I don’t know how many of you are aware, but I have a bachelor’s degree in Chemical Engineering, and have never worked as a Chemical Engineer. No, no, don’t be sad, I’m not really concerned. 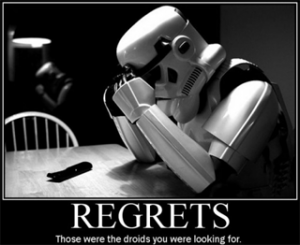 But I do have regrets, I think. And maybe not regrets, but “what if?” questions. I mean, I’m pretty sure I can narrow it down to one specific incident that threw off my schedule and led me to be less interested in chemical engineering. I, admittedly, did not apply myself in my second year and had to repeat organic chemistry in my third year. Due to the timing of classes, I was unable to take one of the compulsory classes and was forced to take classes for a fifth year. This is pretty much when I started questioning whether I was really interested in becoming a chemical engineer. So, what if I had applied myself and passed organic chemistry? Or had studied through the summer and taken a supplemental exam to pass the class? Really, what if I had been able to complete my degree in four years? Would I have become an engineer? Would my life be better? I don’t know. Is it worth thinking about? Probably not. What if I had not left the hotel business and moved to Toronto? What if I had moved laterally (and slightly downward) to Front Desk Supervisor and continued my career within the hotel industry? What if I had stayed in Toronto and continued my web publisher work? What if I had looked for similar work at other companies and stayed in Toronto? What got me thinking about this? Am I unhappy in my job? No. And I don’t know. I think about this stuff every now and again and I wonder what my life would be like now, given some much earlier decisions. Even little things, like what if I’d been offered a particular job sooner and been able to take it, rather than having accepted another job? I try to live in the present, but every now and again the past creeps up and I wonder about things. What makes you wonder? This entry was posted in Opinion and tagged complaints. PPF Neighborhood: Haiti Relief with Médecins Sans Frontières Silver lining?